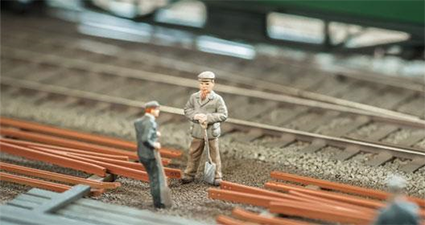 For those with limited space or an appreciation for detailed miniaturization, N scale is the preferred size. Larger than the diminutive Z scale trains and smaller than the bulky HO sets, N scale rolling stock is large enough to show detail yet compact enough to fit on a table-top if so desired. This Article is Part of the “Choose the Right Scale for Me” series, and is intended to provide general as well as some practical guidelines for maintaining your N Scale layout. N Scale is expressed as a ratio of 1:160, which means that one inch in the model is equivalent to 160 inches on the original car on which the model is based. 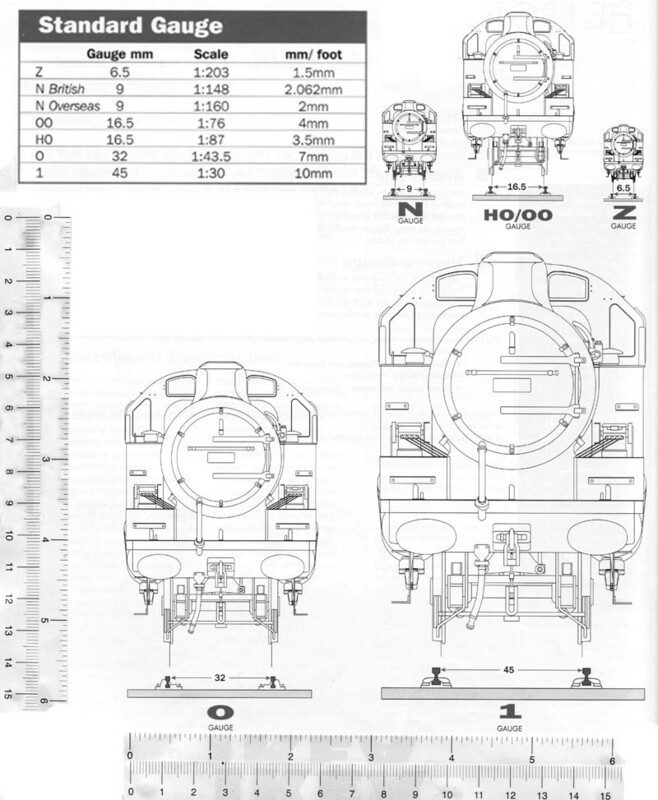 While scale refers to the model’s dimensions, gauge is a reference to the track width of the train set. Some model railroads have set gauges and vary the scales of the rolling stock to fit them; others have varying gauges and a set scale. N scale and G scale model railroads have a fixed gauge and variable rolling stock sizes, unlike HO and O scale trains that are all the same scale but have different track gauges. The following chart compares the sizes and scales of popular model train sets. For model railroad enthusiasts who collect another scale and are interested in expanding their N scale collection, it gives an indication of what the differences mean for space needs and maintenance. N scale trains are toward the middle of the size distribution and are a good compromise between compact layout and fine detail. 1:450 – 1:480 The smallest scale available, T scale trains have a 3-millimeter gauge and rolling stock that fits comfortably on a finger. 1:220 Z scale cars and engines are typically about 2 inches long. 1:148 – 1:160 An N scale model railroad has cars about 3 to 4 inches long and is ideal for compact layouts in small spaces. 1:87 HO scale train sets are the most common; cars and engines are between 6 and 8 inches long. 1:48, but can vary One of the most common vintage sizes, O scale model sets have cars about 8 to 12 inches long. Varies G scale trains are the largest at 12 to 16 inches long. These sturdy sets can operate outside. Now that we have reviewed N Scale, lets move on to what this Article is all about, Maintaining your N Scale layout..
Dust and soil on the track affects the performance of any train, but tracks with smaller gauges need more regular cleaning. 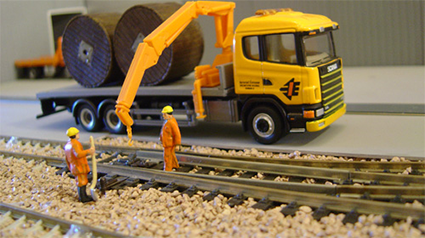 The compact size of N scale railroads is a factor in their maintenance. A bit of lint or grit that would be equivalent to a tiny pebble to a larger scale is akin to a boulder for an N scale train. Powered tracks can also accumulate scale from metal oxides created when the dissimilar metals of the track and the rolling stock’s wheels meet. Model train guides for N scale railroads recommend cleaning tracks with cotton swabs, soft cloths, or plastic mesh scrubbers dipped in rubbing alcohol or a cleaning solution designed for model railroads. Track cleaning pads and cars make maintenance easier, so check hobby shops or eBay for these useful devices. Never clean a track with steel wool; the harsh material leaves microscopic gouges in the metal that collect debris and make future cleanings more difficult. Acetone is also unsuitable as it can dissolve plastic parts. Making the track sparkle is only half the job. Train sets must also be cleaned to work well. Clean wheels on rolling stock with cotton swabs or pipe cleaners saturated with rubbing alcohol or a specially formulated cleaning solution. Like most machinery, N scale train sets occasionally need an application of lubricant to moving parts to keep cars moving smoothly. However, the amount of lubricant needed for these diminutive engines and cars is far smaller than many novice model train owners assume. The tip of a toothpick will hold enough lubricant to keep an N scale train running for hundreds of hours. While over-lubrication will not harm the train set directly, it will collect dust and soil more quickly and lead to more frequent cleanings of rolling stock and tracks. When applying lubricant to a model train’s moving parts, use only a plastic-safe lubricant. Some lubricants designed for metal-to-metal contact can pit, scar, or melt plastic over time. After applying the lubricant, clean the wheels of the train again to ensure that no oil remains on the wheels. Excess oil could cause slipping as the train travels around the track, particularly on inclines. These instructions indicate how often the car or engine should need cleaning or lubricant, how to remove the casing for intensive cleaning, and where to find more information on repairs and troubleshooting. Some manufacturers offer specific recommendations for lubricants, carbon brushes, wheels, and other replacement parts. These instructions are useful for both the rolling stock for which they are intended and for similar model train engines and cars that are being refurbished. For many modellers, restoring and maintaining used rolling stock is an enjoyable hobby in itself. Small parts are more fragile and need more careful handling during cleaning than larger train sets. When cleaning or maintaining N scale rolling stock, buy or build a foam form that holds the car in place as it is being handled. Surrounding the car or engine with soft foam protects small parts from damage, keeps paint from scratching, and makes working with miniature machinery easier. A magnifying lamp can also help when performing routine maintenance or small repairs on N scale railroad stock. Maintenance sometimes involves removing the outer casing of the rolling stock to examine the machinery contained within it. Each manufacturer has a different way of disassembling cars and engines, so refer to the maintenance manual included with the train if possible. If the original manual is no longer available, look for a screw on the train’s underside or hidden somewhere in its upper casing, such as in a chimney or beneath an access panel. Some train sets snap together with slot and tab construction. These sets typically have removable small parts such as railings or antennas, so remove these delicate pieces and set them aside before separating the train’s shell from its chassis. Do not force parts to separate or connect; a piece that appears detachable may be permanently affixed and snap off instead. Of all the parts that keep model trains running, the motor brushes get some of the most intense wear. These small carbon cylinders have screws that hold them against the commutator, the part of the engine that transfers the electrical charge, so they endure constant friction. Cleaning them with alcohol is often sufficient to restore them, but carbon brushes that have become visibly worn may need to be replaced. When disassembling the train to assess the condition of the motor brushes, work carefully. These small parts can easily spring out and become lost when the tension on them is released. Manufacturers sell carbon brush assemblies separately, so if the original brushes do become lost, they are replaceable. Some manufacturers offer free or inexpensive maintenance for tracks and rolling stock for a certain time after purchase. For novice N scale train enthusiasts, this offer is an excellent way to keep trains in good working order while learning how to perform maintenance tasks. Hobby shops may also provide maintenance services or instruction in home maintenance for model train sets. Some avid collectors offer tips and advice on maintenance; find them via model train clubs or forums. After spending time making the track gleam and polishing rolling stock to a shine, freshen the layout for a model train set. Compressed air dismisses dust that settles on miniature bushes and boulders, but hold the nozzle far away from delicate parts to avoid blasting the leaves from tiny trees. For sturdier structures with regular shapes such as rooftops and bridge supports, a soft cloth can remove dust easily. Use a flexible gum eraser to remove dirt from small crevices. Cleaning fluids can discolor some paints and dyes, so test any cleaning solution before applying it to a larger area. Like real rolling stock, N scale model railroads need occasional maintenance. 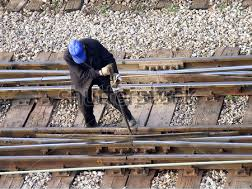 The tools used may be toothpicks, pipe cleaners, and pencil erasers instead of cranes and crews, but in some ways, the process of replacing wheels and keeping tracks in good working order are similar to the tasks railway workers do to keep freight and passengers moving. Protect your investment in model railroads with proper maintenance, and you may well find that your trains can last for generations.